Chase Freedom® and Discover It® -Cashback MatchTM are two of the best credit cards on the market. Neither charges an annual fee and both have generous cash back rewards programs, as well as enticing sign up bonuses for new members. If you like the idea of a cash bonus upfront, Chase Freedom® is your best bet. Every 3 months, you also receive 5% cash back on select rotating categories, which is a benefit you receive from the Discover It® – Cashback MatchTM too. You also get free access to view your FICO® Score from the Discover It® – Cashback MatchTM card. 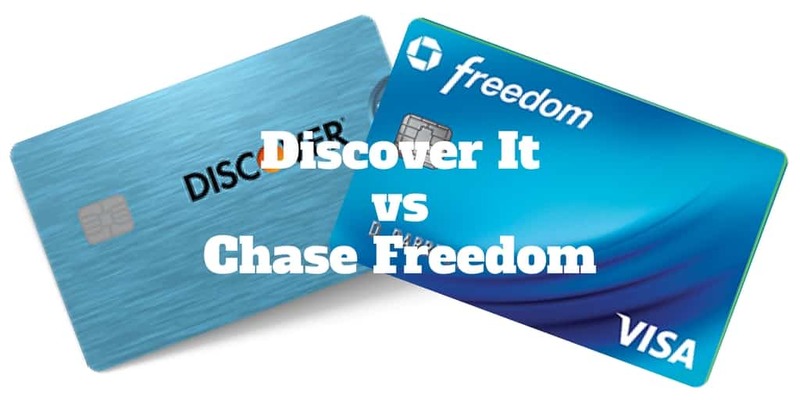 When you compare Discover It® Vs Chase Freedom®, you quickly discover it’s a close call, but where will you earn most benefits as a cardmember and which card is best for you? Discover It® Vs Chase Freedom®: Which Is Right For You? The small print on the new cardmember offer is that you receive the $150 bonus after spending $500 on purchases in the first 3 months after opening an account. Beyond the 5% cash back on bonus categories, you also receive 1% cash back on all other purchases. And if you sign up primarily for the 0% introductory APR rate for the first 15 months, schedule a calendar note when it expires because thereafter the rate increases to between 16.24% and 24.99%. 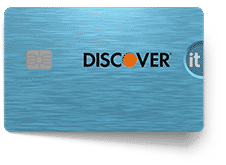 Discover It® – Cashback MatchTM has a less attractive sign-on bonus but it makes up for that with silver linings: free access to your FICO® Score and and a 0% charge on foreign transaction fees compared to a 3% charge by Chase. Discover It® cardmembers also receive 1% cash back on all purchases other than the bonus categories, which earn members 5%. And while the 0% introductory APR rate period is slightly shorter at 14 months compared to 15 months from Chase Freedom®, the rate range is lower: 12.24% → 24.24%. Discover will also automatically match 100% of the cash back you earn at the end of the first year. Merchants who do not specialize in selling automotive gasoline; for example boat marinas, oil and propane distributors, home heating companies, and truck stops do not qualify. For internet, cable, and phone services, purchases of equipment are not included. 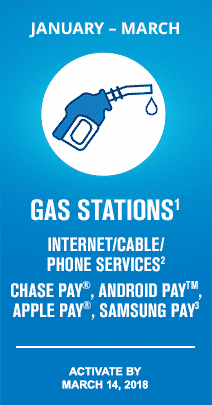 Only purchases for internet, cable, satellite television, wireless data, landline services, radio, and cellular qualify. Eligible purchases earn the 5% cash back rewards on up to $1,500 in combined purchases. Between January and March, earn 5% cashback bonus at gas stations & wholesale clubs on up to $1,500 in purchases when you activate. On purchases made over $1,500, you earn 1% cashback. The same purchase restriction applies to grocery stores between April and June, restaurants between July and September, and Amazon/Wholesale clubs between October and December. Grocery Store Exclusions: Grocery purchases at convenience stores, gas stations, warehouse clubs, supercenters, and discount stores are not eligible. Also purchases made using tap-and-pay, mobile or wireless card readers, virtual wallets or similar technology may not be eligible. Restaurant Exclusions: Restaurant purchases are made at merchants classified as full-service restaurants, cafes, and cafeterias, and fast food locations. If you buy using tap-and-pay, wireless, or mobile card readers, as well as virtual wallets or similar technology, the purchase may be deemed ineligible. Amazon & Wholesale Club Exclusions: Travel and cell phone purchases may be ineligible when purchasing from a Wholesale Club. Rewards are added to your Cashback Bonus account within two billing periods. Discover It® – Cashback MatchTM and Chase Freedom® are identical when it comes to charging no annual fee but thereafter Discover has the edge on foreign transactions and APR rates. Discover may not be available at as many merchants abroad as Visa, so although Discover charges no foreign transaction fee, Chase may be more attractive when it comes time to buy something you really want if the store only accepts Visa. When it comes to APR rates, Chase loses the battle ever so slightly to Discover, which has lower rates especially at the lower end of the range. >> Related: Why Was My Credit Card Declined? ✅ No Annual Fee: Discover doesn’t charge an annual fee. ✅ No Annual Fee: Chase won’t cost cardmembers a dime in annual fees. ✅ Foreign Transaction Fee: Unlike Chase, which charges a 3% fee, Discover doesn’t charge any fee on foreign transactions. ✅ 0% Introductory Offer: Chase offers a slightly longer introductory period of 15 months versus 14 months available from Discover. ✅ APR Rates: Discover It® – Cashback MatchTM charges slightly lower APR rates than Chase Freedom. ✅ Cash Sign Up Bonus: Unlike Discover It® – Cashback MatchTM, Chase Freedom provides a $150 cash sign-up bonus. ✅ 5% Cash Back: Both Chase Freedom and Discover It® – Cashback MatchTM offer 5% cash bonuses on select categories. ✅ 5% Cash Back: Whether gas stations, online purchases, or other rotating categories, Chase offers 5% cash bonuses on select categories that rotate. Discover It® – Cashback MatchTM is ideal if your spending habits match those of the bonus categories. For example, if your spending on Amazon increases in the final quarter of the year during the holiday season, Discover It® – Cashback MatchTM may be best. You will also find Discover to be the better choice if you like to have free access to your credit report. Where Chase Freedom® has the edge is the cash bonus when signing up. 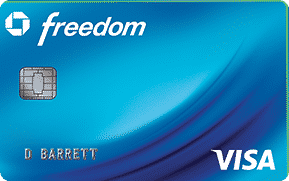 Plus, Chase Freedom® is a Visa card so it may be more widely accepted. However, if you travel overseas, Chase Freedom will penalize you with a hefty 3% charge on purchases abroad. You won’t be charged an annual fee when you sign up to either the Chase Freedom® credit card or the Discover-It® credit card. Between Chase Freedom® and Discover It® – Cashback MatchTM, Discover is better if you spend heavily on Amazon over the holidays or travel overseas thanks to its 0% foreign transaction fee. Chase is better for cardmembers who want a cash bonus signing up and whose spending habits align with the quarterly bonus categories offered. If you already have the Chase Sapphire Reserve credit card, Chase Freedom is the better choice because you can transfer points earned in 5% categories to the Reserve card and then redeem for travel via the Chase Ultimate Rewards Portal at an even better conversion rate.